TROY — The engineering technology developer Altair Engineering Inc. (Nasdaq: ALTR) announced the release of version 18 of its PBS Professional workload management and job scheduling software for high-performance computing. The company said the new release addresses the highest priorities for organizations who rely upon HPC: scalability, performance, robustness and security. Altair’s PBS Works software platform consists of highly integrated applications to connect users and administrators more closely with HPC resources to maximize utilization and efficiency. Altair PBS Professional is at the core of this platform offering to manage and optimize job scheduling by intelligently balancing productivity and efficiency. Also in the platform are Altair Control, tailored to the needs of HPC administrators, and Altair Access for the end-user community. With Altair Access, user communities across the enterprise can easily access local, distributed and cloud HPC resources through a single, intuitive user experience. Altair Control delivers a unified web interface for HPC administrators to control HPC resources, clusters, supercomputers, and clouds — to configure, monitor, troubleshoot, report, analyze, and even perform what-if simulations to right-size hardware expansion. 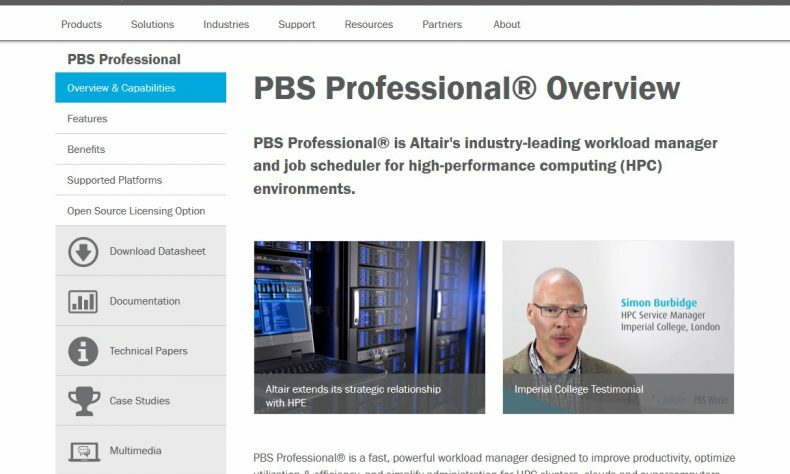 Visit http://pbsworks.com/2018webinar for a full list of release highlights, new features and to register for an upcoming Altair PBS Professional roll-out webinar. Altair has more than 2,000 employees at 71 offices in 24 countries, serving more than 5,000 customers with product design and development, engineering software and cloud computing software. More at www.altair.com.